Naturally, dirt and concrete, over time, will allow moisture to pass through, eventually causing your crawl space to become damp and moldy if a barrier is not installed. As you can imagine, this moisture, if ignored, can cause your wood to weaken due to rot. Known as crawl space encapsulation, this is a process of installing a thick plastic liner to seal the entire crawl space, from the floor to the walls, including any vents, to prevent moisture from entering the area as the area is now sealed. Aside from a crawl space, it can also be used in a basement without a floor or an underground space with uneven floors and/or ceiling. As you can see, there are many factors that can affect the price, and for that reason, it can be hard for us to offer an exact estimate. For your job, we highly recommend you check out HomeAdvisor.com, a free online tool that allows you to receive quotes from local contractors online. Here, you simply explain your job and licensed contractors in your area will contact you with a quote. No credit card is required. Crawl space experts, according to this Angie List article, state the average crawl space will cost about $5,500 to encapsulate, but the costs can increase to as much as $15,000 depending on the size and issues of the home. One person on this Houzz.com forum thread stated they received a $12,450 quote for 1,500 square feet. More than just the barrier, however, this quote included a 20-mil clean space liner, 175 linear foot perimeter drainage piping, two sump pumps and a dehumidifier. According to the responses on the thread, many claimed the price was too high, with one person, in particular, stating they paid $2,300 for their 1,260 square foot area. The geographical location – The geographical location of your home can greatly affect the price as a home in the south with a lot of moisture will need much more preventable work done when compared to a crawl space located in a dryer climate. The size of the home – As with any job, the size of the crawl space will affect the price as well. The more space that needs to be sealed, the more materials and time this means for the contractor. For just the materials, again, depending on the thickness, plan on budgeting at least $3 to $6 per square foot. Condition – A crawl space with a lot of items and standing water will take much more work than a clean crawl space with minimal moisture problems. Since contractors will charge based on their time, and again, the materials necessary, the condition of the crawl space can be a breaking point when it comes to a quote. Quality – The quality of the materials chosen, especially the thickness of the vapor barrier, can increase the costs drastically. As we talked about in the costs subheading above, the thicker you want your barrier to be, the more you’re going to pay in materials. But with anything, however, the higher costs isn’t a bad thing since thicker barriers prevent more air from seeping into your crawl space area. Moving items out – If you use a crawl space for storage, you will need to ensure the entire crawl space is 100% empty to install the vapor barrier correctly. If you leave this up to the contractor to clear the space, then be prepared to spend at least $45+ per hour, per person to clear your space. These costs will greatly depend on the number of items that need to be removed, the contractor rates and the overall complexity of the job. Pest removal – In the case of pests, you may need to control a pest control expert before the contractor even considers the job as you do not want pests beneath the vapor barrier as it’s being installed. Dehumidifier – Some contractors may recommend a humidifier as in some cases, even with the barrier, moisture can still find its way in. A good humidifier, designed for a crawl space, can cost well into the $1,000 to $2,000+ range. Sump Pump – Even if you already have a sump pump in the crawl space, there may be instances where the contractor wants to install another one, usually at the opposite corner of the other pump. Permits – In some areas, a permit may need to be pulled, but this isn’t always the case. Talk with your local zoning board for more information in regards to if you need to pull a permit or not. Before the barrier is even installed, the entire crawl space will need to be cleared out in order for the contractor to access the ground. The ground floor is always graded to ensure no rocks or any other debris can rip up the barrier as it’s installed. After the ground floor is graded, the vapor barrier, either chosen by you or recommended by the company, will be installed and sealed using special tape. All gaps and seams, from the floor to the ceiling, including the vents, will be sealed airtight, with the seams overlapping by at least a foot. In the past, experts forewarned that sealing the vents could be a bad idea as it was assumed the vents would allow the moisture to escape, but this isn’t the case. Nowadays, contractors will seal these vents as it is acceptable to have a 100 percent closed crawl space, but before doing so, all water leaks and a dehumidifier to control the environment will be necessary to assure the encapsulation works in the first place. Lastly, after the entire room is encapsulated, drains leading the troubled areas may be lead to a sump pump or outdoors in case the moisture were to arise again. Aside from preventing moisture from entering the area, a properly encapsulated area can also lower cooling costs, improve your indoor air quality, seal off incoming warm air, eliminate condensation buildup, increase your home’s value, protect your pipes from bursting and can keep the floors above cooler in the warmer months, according to AffordableFoundationFix.com. When hiring a professional, it could be tempting to hire a local handyman due to the price, but it’s best to consider a company that has crawlspace encapsulation/waterproofing experience to ensure the job gets done as it should. Be sure to ask for references, check their reviews online and always ask for a free estimate on site to know what you’re getting with the job. 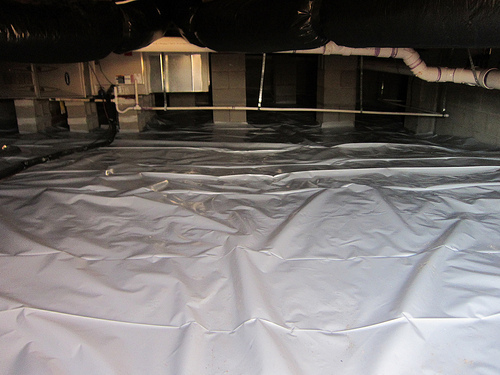 There are a lot of unethical contractors out there, even if they have good reviews, so it’s important to get more than one opinion to ensure your crawl space needs this vapor barrier. In some cases, a simple sump pump and/or humidifier can resolve a problem, for example. The National Waterproof Members of America has a database you can search for reputable contractors in your area.